This bunker lies in the centre of Utrecht. For a long time it was unknown what its function during the war has been. After heavy research it is for sure that it was or had to be, a very important telephone exchange- and transmissioncenter, in which communicationlines from all over Holland and Germany came together. At the end of the war the Germans used mulitplex equipment in order to transport many telephonecircuits over just one groundcable. The equipment for this system used many electronic valves, which produces a lot of heath. 3 meter high ceilings make the installation of big airducts above that equipment possible. 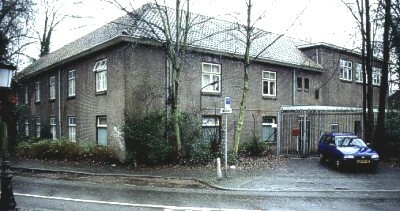 The bunker was re-used by the Dutch Army after the war and converted to Coldwar standards. It had two floors, with walls 3 meters thick. 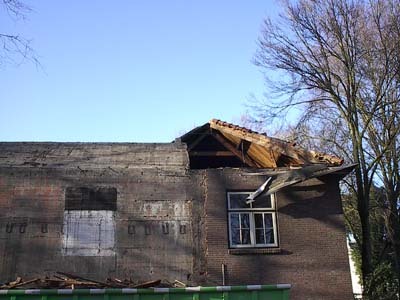 Unfortunately after years of fight by several Dutch foundations, coordinated by the foundation Militair Erfgoed, the bunker has to be demolished to make place for some new penthouses. Early 2004 the demolishing has started, but the first results of a failed test-blast proved hat it will to take a lot of extra time and money before this interesting giant will be completely destroyed. 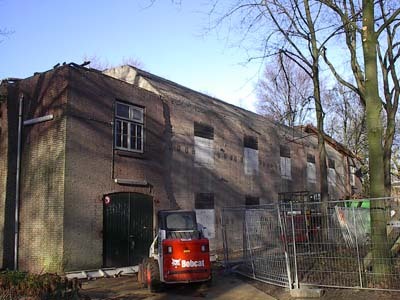 An old photo of the bunker with the brick walls and the dummy windows as camouflage. 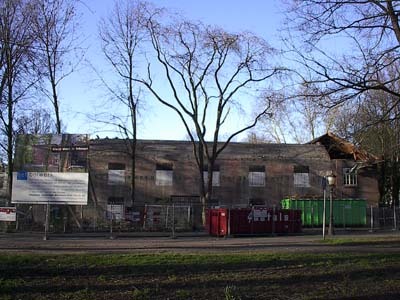 After the brick walls were put down the German dummy windows became visible. A dummy window on the bunkerwall (left) and a genuine in the side-building.